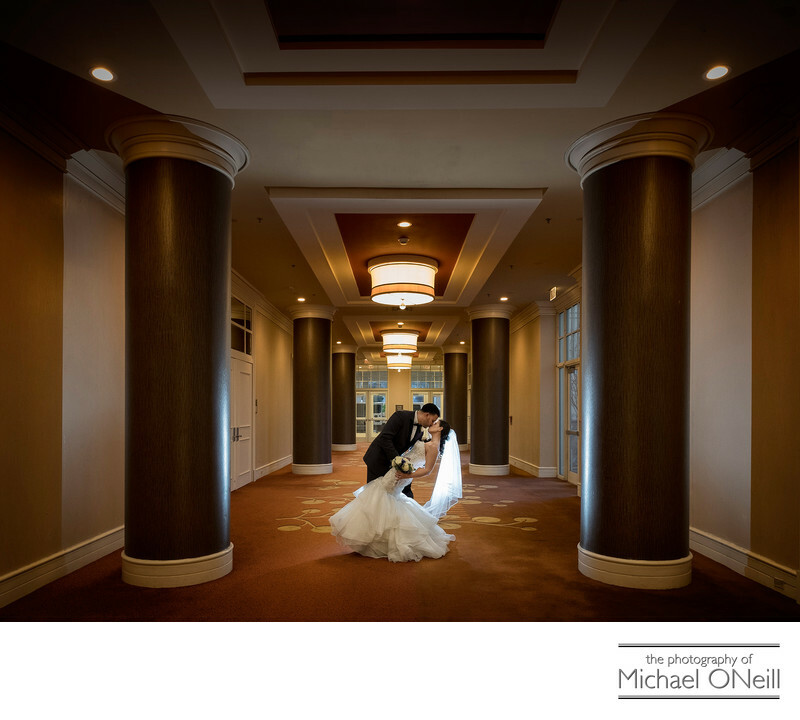 This dramatic wedding picture was captured outside the Grand Ballroom at The Hyatt Regency Long Island in Hauppauge, NY. I’m often asked by my wedding clients what we’re going to do if there is bad weather on the wedding day. One of my first responses is to ask if they have arranged for a block of rooms for out of town guests at a local hotel. The hotels are always accommodating to clients who do this, so, on a brisk December day we went to this wonderful luxury hotel to create photographs with the bride and groom, their wedding party and their friends. I have taken many photographs over the years in this very same spot. The bold modern architecture, with the columns and chandeliers makes for an exciting environment for contemporary indoor bridal photographs. The diagonal composition of the groom dipping his bride in a romantic kiss contrasts with strong vertical lines of the interior, and the leading lines of the adjacent walls, to draw the viewer’s eyes directly to the couple. So… to the list of things to ask your wedding photographer add these…their plans for photographs in event of inclement weather and their experience at the indoor location you decide upon as your Plan B on the big day.